Although designed for kids, we had an absolute blast with Razor’s original Crazy Cart. The XL version was an awesome upgrade for adults who wanted to play too, and now Razor is introducing an improved version of the original that makes it even easier for kids to drift around corners. 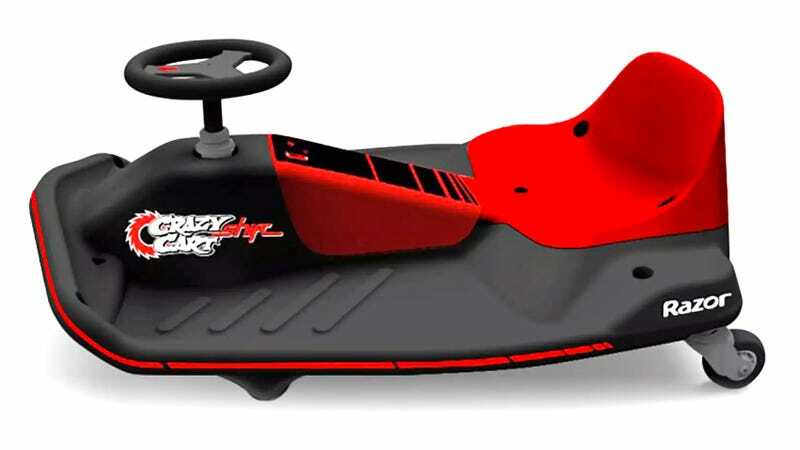 The Crazy Cart Shift, designed for kids aged eight and older, does away with the drift bar that the original versions relied on for putting the tiny cart into a slide. It’s all handled by the steering wheel now, and steeper rear casters, so it feels a little more like drifting a real car. Although it’s up to parents to decide if they want kids mastering those skills years before they even get their license. The Crazy Cart Shift also does away with a chain drive connecting the drive wheel to the motor, so there’s less parts to fail or break. On a full charge its 24-volt battery will provide a decent hour’s worth of drifting, and when the Shift launches later this year, it’s expected to come with a price tag of around $199.